Real Canadian Butter Tarts, eh? 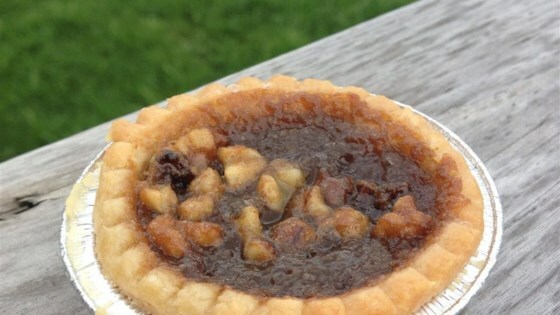 "These butter tarts are traditionally Canadian, made with sweet maple syrup." Preheat oven to 425 degrees F (220 degrees C). Place tart shells on a baking sheet; sprinkle raisins evenly into the bottom of each tart shell. Whisk together butter, brown sugar, maple syrup, vanilla extract, and salt in a bowl; whisk in egg. Pour mixture into tart shells; sprinkle each tart with walnuts. Bake in the preheated oven until pastry is light brown and filling is bubbly, about 12 minutes. Cool on a wire rack, about 10 minutes. Check out this no-bake, icebox pie! Made this recipe exactly to the recipe. Freaking fantastic!! And so quick and simple! Thank you!! The only thing I changed was getting maple syrup from a friend. You can really taste the love! Best butter tarts I've ever had! It's a keeper of a recipe. I used my own regular pie crust recipe but the butter tart filling was superb!